It's one week before High Point Market, and we're very excited to share this news! Debuting at High Point, our new MIX & MATCH CONTAINER PROGRAM will change the way you do direct container shipment. With a number of participating partners, this program will allow you to place container orders with combined SKUs and very little restrictions! Over 50 SKUs to choose from. From sofas to beds, the program spans multiple product categories in different materials, colors, and finishes. 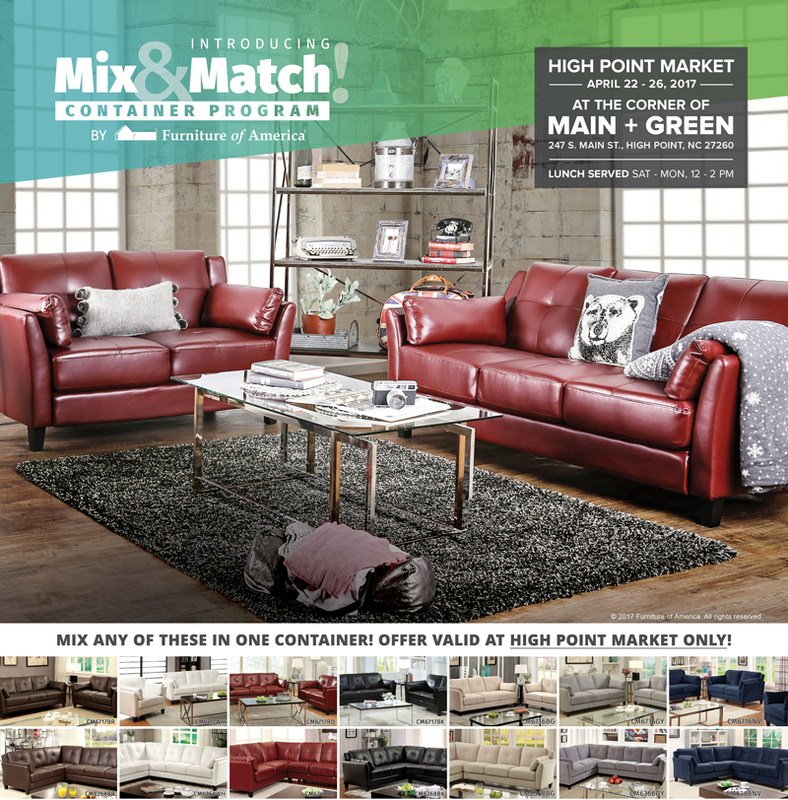 There's tons of options, so whether you're looking for that plush, fabric sofa or a sleek lacquer dining collection, Mix & Match program has it! No minimum quantity required. Why order one hundred oak bunk beds when you can first order ten to test it out? Mix & Match has no restrictions on minimum orders for each SKU, so you can go ahead and test the waters. The fear of overstocking is a thing of the past! Amazing prices only at High Point. To show our appreciation to those who take time to come to our showroom, we are offering a discount to some of our Mix & Match products! You'll be the first in line and receive special market-only pricing. So make sure we're in your itinerary! Come visit us at 247 S Main St., High Point, NC on April 22 - 26, 2017. We're conveniently located at the corner of Main Street and Green Drive. Lunch will be served through Monday at 12 - 2 PM, so stop by and grab a bite. Opening Day Party on Saturday, April 22 at 5:30 PM. Join us for live music, hors d'oeuvre, and cocktails! We also have giveaways for you to take home. All market attendees are welcome! This entry was posted on April 6, 2017 by FOA Team. Hi Elizabeth, thanks for your interest! Our Container Sales Department will be glad to help. Please reach them at csales@foagroup.com or call them directly at 1-866-923-8500 x197. Thank you! I am a prospective furniture and deco business owner, website in construction I am interested in more information about FOA. I bought a dining table from FOA and many of my friends loved it. I intend to do export. My address is 425 E 110th street, apt 856, New York, NY 10029. Thank you! Hi Sadio, thank you for reaching out! Our associates from the New Jersey branch will be able to tell you how to get started. Please email us at info.nj@foagroup.com or you can call 201-605-8200. Thank you!